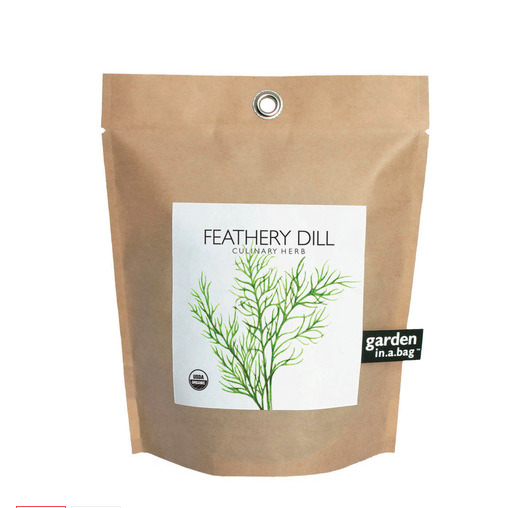 Organic Feathery Dill (Anethum graveolens) A culinary herb with a fresh flavor of licorice and parsley. Dill makes a delicious accent to fish, eggs, vegetables, cheeses and soups. Chop and add fresh at the end of the cooking process for the best flavor. As you harvest your dill you will encourage more growth. Includes: organic seed, growing medium, coconut husks for drainage, directions. Bag 7" high x 6" wide.